Facebook's rollout of Timeline and the privacy concerns that go along with it could drive some users down a less-traveled path. For those who like sharing what they're doing with friends, there's a mobile app you probably haven't heard of that may be a good alternative. It's called Path, and it has been getting great reviews and quite a bit of press with tech media since it launched a redesign two months ago. First, it's trying to be a social network that is more personal, one in which your friends are actually people you currently have in your life. In fact, when the app launched, it let you have only 50 friends, although now that number has been bumped up to 150. This is in contrast to Facebook, which lets you amass hundreds of "friends" if you want them, but in actual practice many of these people are sometimes far from it. 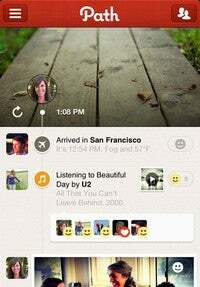 Path calls itself a journal and lets you share your thoughts, the music you're listening to, your location, who you’re with, photos and videos, and oddly, when you go to sleep and wake up. You can also use it to post to other social networks. And since photo-sharing has been a big part of what users like about Path, this week it also added a new feature to the iOS version that shutterbugs will like. Called "Depth," it’s a tilt-shift capability that lets you adjust the depth of field so you can change what’s in focus in your photos. Available for iOS and Android smartphones, it's beautifully designed with a clean and simple look and feel -- one that’s lightweight compared to Facebook, which has so many features it can be hard to keep track of them all. While Path recently announced it now has 2 million users, that's a far cry from Facebook’s 845 million users, so the question of whether it will achieve widespread adoption is a big one. But if you can convince a few of your closest friends and family to give it a try, you might find it to be a less harried way to connect.